Removing paint swirls from your Toyota's paint is easier than you think. With a bit of patience and the right supplies, you can have your vehicle looking better in no time. Read on to find out how to properly remove swirls in your truck's paint. Paint swirls are quite common and can occur over time due to improper washing and drying techniques, using a dirty cloth or chamois, and many other factors. Unfortunately, these marks are much more visible on black and darker colored vehicles. While you don't need a new paint job or a similarly drastic fix, you will want to take care of the issue sooner rather than later. The good news is that the job is relatively straightforward and inexpensive. 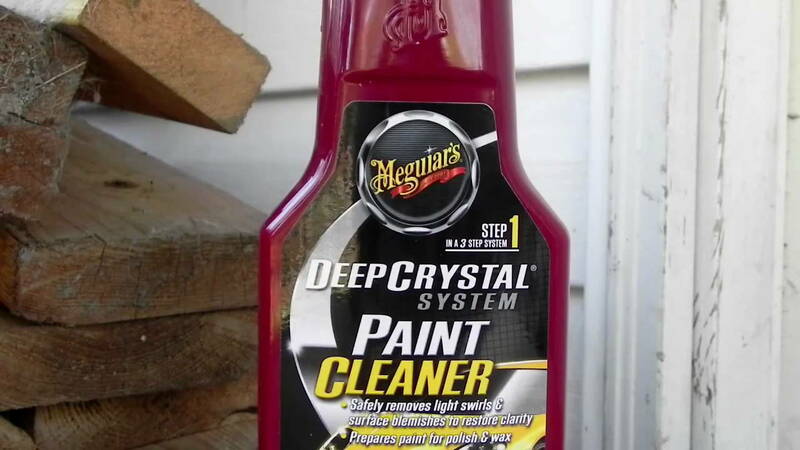 Use car paint cleaner to remove buildup of dust, dirt, and other residue. There are abrasive and non-abrasive types of car paint cleaner. You'll also find a selection of abrasive levels. If you're using an abrasive paint cleaner, try to go with the least abrasive option, especially if you've never done this type of work on your vehicle. It's also a good idea to check before starting if the cleaner you're using requires time to dry before moving on to the next step. Figure 1. Car paint cleaner. When using a paint cleaner, be sure to keep your hand movements to a single uniform direction. This will keep all paint scratches in the same direction. When polishing the paint you'll be rubbing in a mildly abrasive paint conditioner. While there are harsher conditioners on the market, these can sometimes lead to effects such as hazing. This type of polish, sometimes reffered to as a glaze, comes in hand and machine variations. Either one will get rid of oxidation and water spots in addition to pesky swirl marks. After polishing the paint, you'll need to add some extra protection in the form of wax. Figure 2. Polishing with wax makes a big difference. Many Toyota 4Runner owners have found the Porter Cable random orbital buffer to be safe and effective. However, it can be expensive. Waxing adds an extra element of protection to the paint you've just polished. For best results, use a good quality wax. Not only will this make the paint easier to clean, but it can also help to maintain the hard work you've put it removing the paint swirls. A good quality wax can be applied every week without subjecting the vehicle's paint to unwanted buildup. Figure 3. 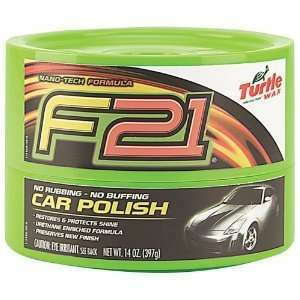 F21 car polish wax. 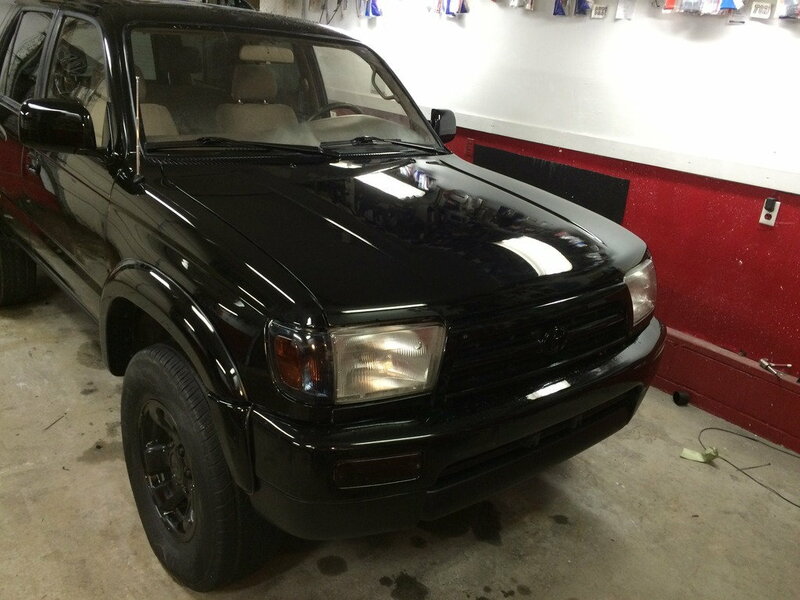 A number of 4Runner owners find Zaino products, including wax, to be particularly effective.